While I was teaching computer classes, I always stressed this fact. 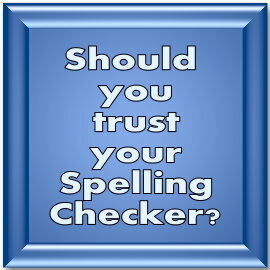 Spelling Checker tools are great, they help you find some of your mistakes that you might not otherwise find. However, they will not catch everything. You should still re-read all your documents. Spelling Checker utilities or applications work by comparing every word in your document to a dictionary that is built into the application. There are two instances when the Spelling Checker may be wrong: 1) It may not catch words that are mispelled, and 2) it may mark words spelled correctly as misspelled words. Because the utility is comparing words you type to a dictionary of words, it will not catch it when you use a real word that is not the right real word. For instance, if you type 'than' instead of 'then', it will not be marked as wrong. The following sentence has mistakes caused by using the wrong word, but most, if not all, spelling utilities will not catch these. Four instant, ewe cud go two the see weakly fir heath. For instance, you could go to the sea weekly for health. Why? The word processor compares each word to the dictionary and the words used in the first sentence are real words and are correctly spelled. It doesn't matter that the wrong words were used. This is true of most word processor applications, including Microsoft Word 2016. I love the built-in spell check tool, and I use it, but I don't trust it implicitly. Again, the way these applications work is to compare the words in your document to the word processor's dictionary. Suppose you are writing a document full of technical jargon. Suppose you were writing a paper on elephants. You might decide to use the word 'probiscus' to describe the nose. Most word processors will not have the word 'probiscus' in the dictionary, so it will be marked as misspelled. If you have to use a word that is not in the dictionary several times in a document, you can see a lot of words unlined in red in your document. There are two ways to deal with this in Microsoft Word: 1) Right-click the word that is underlined in red, then click Add to Dictionary. 2) Right-click the word that is underlined in red, and then click Ignore All. Be careful when adding words to the built-in dictionary. Before using that option, make sure the word is correctly spelled. Otherwise, you will have a misspelled word in your dictionary, and the Spell Checker will no longer catch it for you. Use an online dictionary or a hardback or paperback dictionary to check the spelling of words before adding them to your Spelling Checker dictionary. So, what can you do to make sure you don't have a document riddled with spelling errors or wrong word usage? Read the document once through, then read it again aloud. You may be surprised how many more mistakes you find when you read aloud than when you read silently. As the paper's author, you subconsciously know what words you 'intended' to write, and you may subconsciously insert the words that you thought were there without realizing it. Reading aloud is a tool that works for anyone, student, author, business professional, or professional editor. Don't trust your word processor's Spelling Checker. It's a good tool, but not infallible.